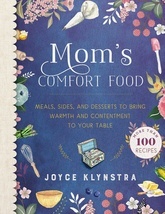 In the tradition of friends and family swapping recipe cards, Mom's Comfort Food pulls together more than fifty years of cherished meals, sides, and desserts that will bring warmth and contentment to your table. These easy-to-make dishes will inspire fellowship around fabulous food.Many seasonal choices will help you take advantage of fresh, local produce from creating strawberry and rhubarb desserts to preserving tomatoes and sweet corn. All recipes are sure to bring smiles to everyone gathered around your table. With a photograph for every recipe, this book celebrates the beauty of hearty, home-cooked comfort food.